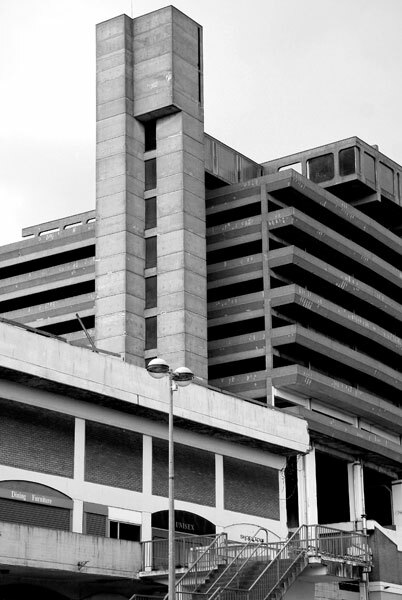 Until its demolition in 2010 the enormous car park above the Trinity Square shopping centre in Gateshead dominated the town and the horizon from across the river in Newcastle. 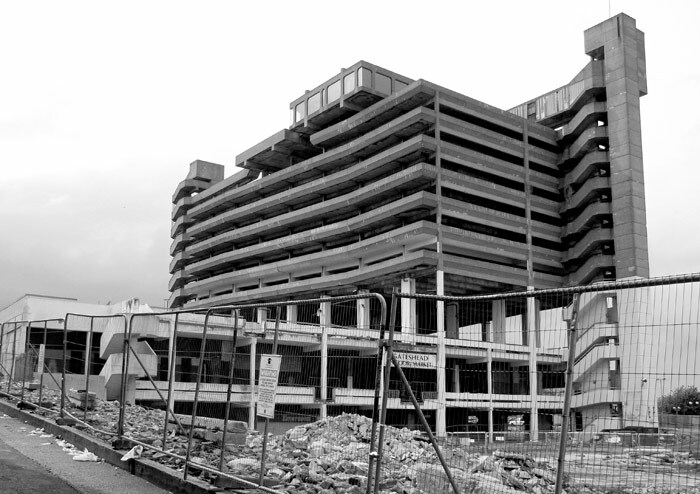 It was popularly known as The Get Carter Car Park for its appearances in the 1971 film, 'Get Carter'. Here, it overlooks Robert Stephenson's 1849 road and rail High Level Bridge and buildings on the south bank of the River Tyne. After the structure's demise, the Windmill Hill Park now offers a much wider panorama of Newcastle from west to east. 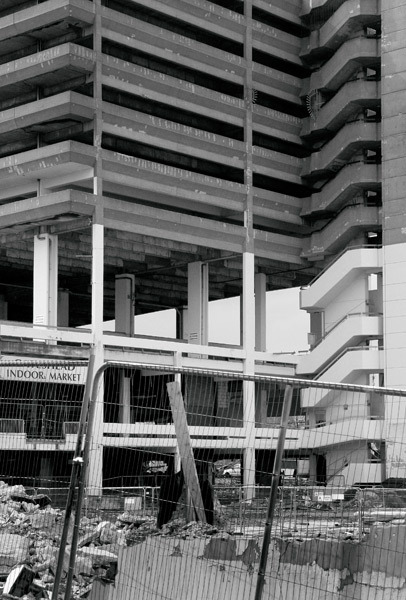 From the nineteen-sixties Newcastle and Gateshead undertook major redevelopments of their central areas, with Trinity Square as the latter's largest contribution. The Owen Luder Partnership developed designs for shops on several levels across a large rectangular site with a centrally placed and oversailing seven-storey car park. 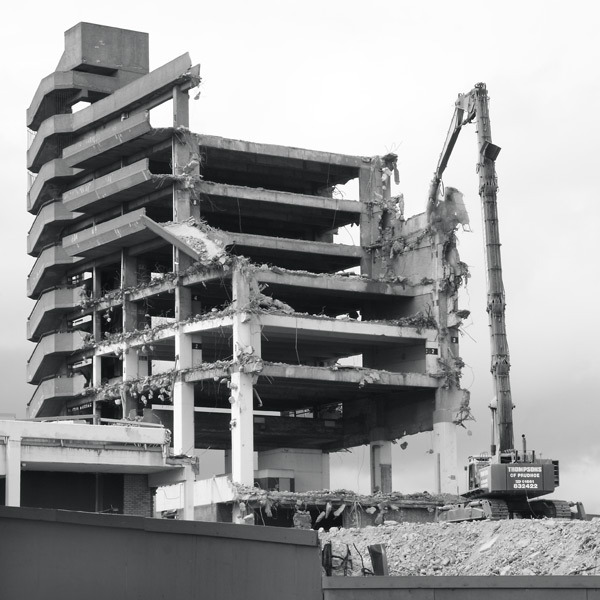 It was completed in 1969 in the Brutalist style. The shops were located within a concrete frame that enclosed a blue-grey brick infill. 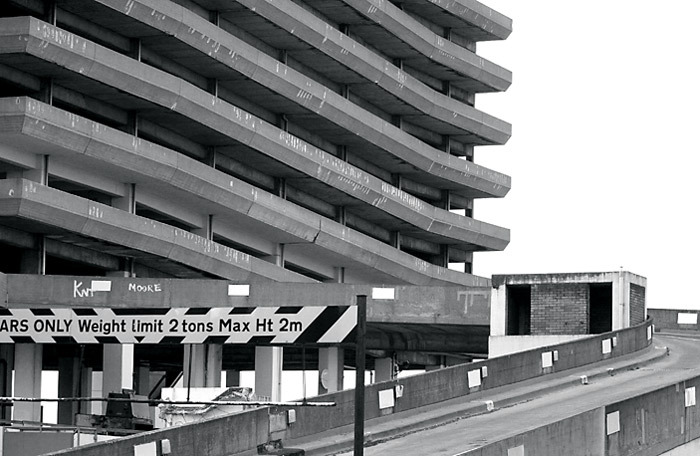 The inner structure of the car park followed this system, with the deck parapets turned upwards from their concrete floors. Its topmost level carried a large-windowed restaurant building that would have offered spectacular views to diners had it ever been completed. 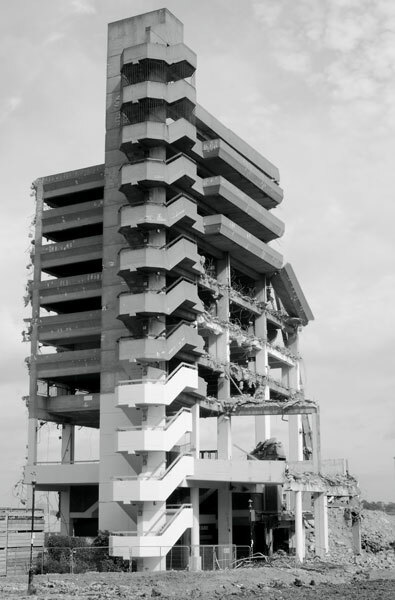 In the nineties several of the upper parking decks were closed for structural reasons. 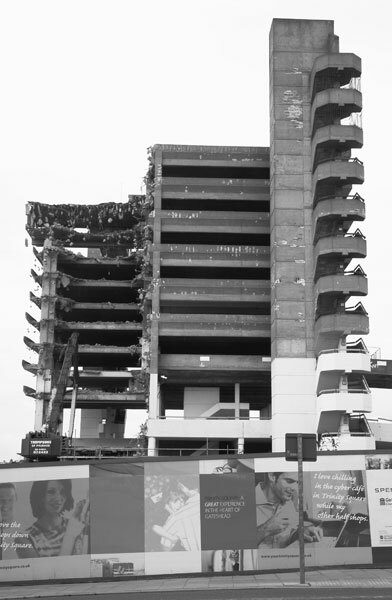 The white surface flashes show where concrete has increasingly fallen away to leave the steel reinforcing rods exposed. Trinity Square was intended as a major shopping centre but competition from later, larger, and more attractive schemes in Newcastle and further west in Gateshead contributed to its decline. Some changes were made to enhance the interior but it always seemed a rather overpowering and depressing place to visit. 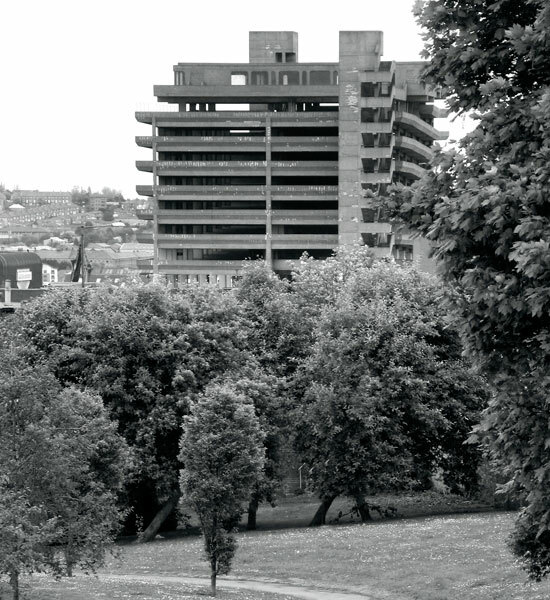 The Luder Partnership also designed the nearby 1971 Derwent Tower as social housing. In concrete and buff brick, its twenty-nine storeys carried one and two-bedroom flats. Large triangular buttresses against the first five floors prompted 'The Dunston Rocket' as a popular name. Structural neglect, lack of maintenance and other negative factors made it unpopular with tenants. It stands empty and it too is scheduled for early destruction. 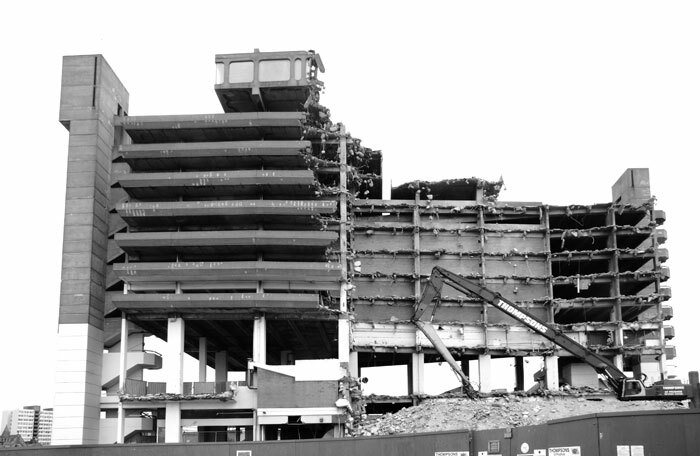 When I knew that Trinity Square was to close I tentatively photographed from the surrounding streets. The site owner/developer was adamant that permission to photograph from within the site boundaries would not be granted. I was away from home on the one day when the car park was opened to the public. 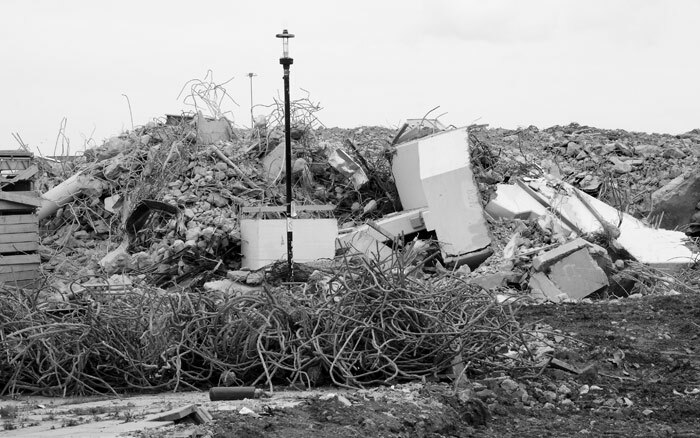 I documented the demolition of the car park and visited on some fifteen occasions between May and October in 2010. Working through the collection to choose eighteen images for this gallery I was struck by the weather record. My short visits were at random but most days seemed to be under overcast skies that toned well with the concrete but markedly reduced contrast in the photographs: few days were like that caught in 07. Almost all the shopping centre had gone before the first cuts were made into the car park. The foreground structure in Image 03 shows something of the scale of the former but by then its large and undulating roofline forms had been removed. 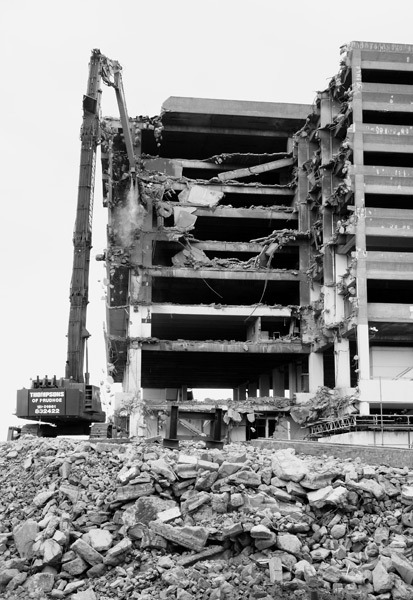 The car park was surrounded by concrete rubble with accumulations of steel reinforcing bars and other metal scrap constantly sorted as work progressed. 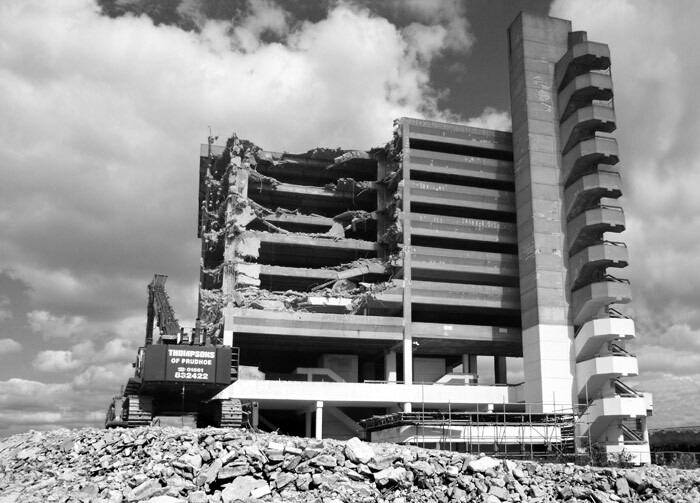 In 2007 I documented the demolition of Newcastle Central Library, a concrete building designed by Sir Basil Spence and opened in 1968. Then I was literally across the street and able to close in tightly on the machinery rather than shooting over the wide spaces enclosing this car park. In some of those earlier images support workers occasionally lent scale as they appeared alongside the cutting head, here shown grounded at the end of a day. 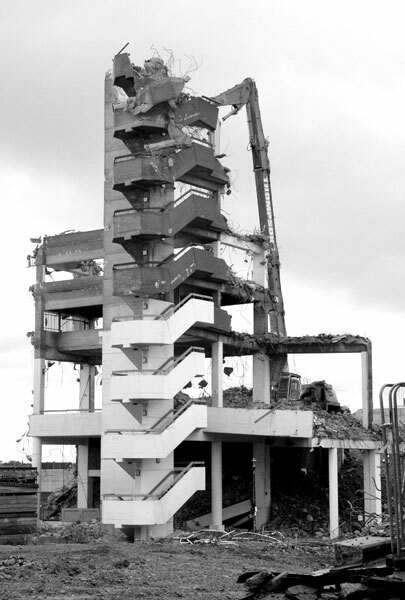 I was struck by the skill of the demolition crews. 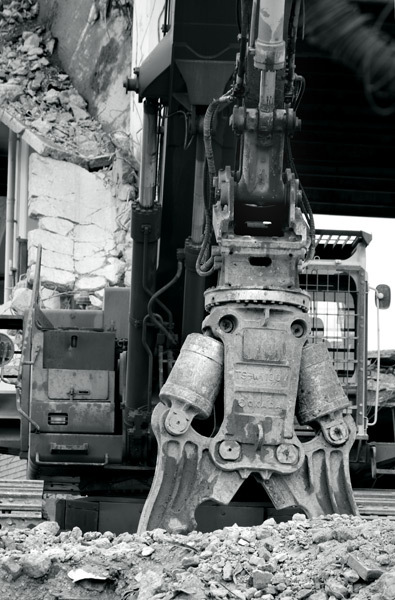 Presumably aided by a camera mounted near the end of its arm an operator would delicately manoeuvre the large cutting jaws with great precision. Sometimes this required angled penetration into constricted spaces with attendant adjustments and turns before the cutting edges could be closed. A water spray on the upper arm dampened the flying dust and the concrete surfaces earlier in the work but a contact must have changed its alignment. For much of the time I was there the dry dust blew around unhindered, obscuring working details and occasionally drifting over spectators. On one street the contractors had cut small viewing windows unto the site's high wooden walls to provide restricted direct vision and convenient camera rests. 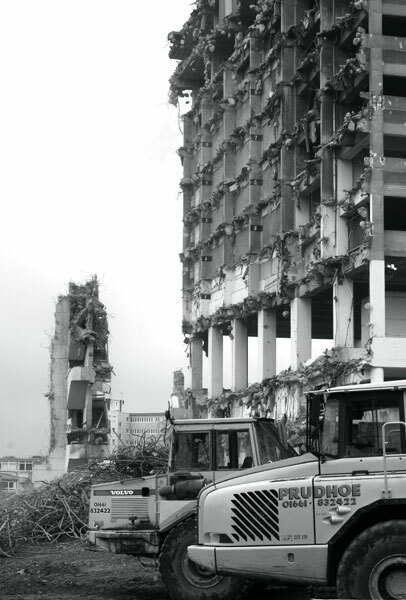 The cutting jaws shattered the concrete and cut through its steel reinforcement like scissors through card and string. The staccato sounds generated high above were like those from crackling fireworks. 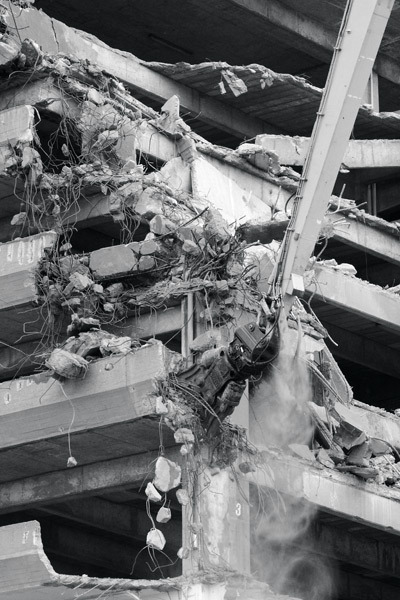 At ground level other machines used crushing jaws to split the concrete from its steel rod reinforcements. 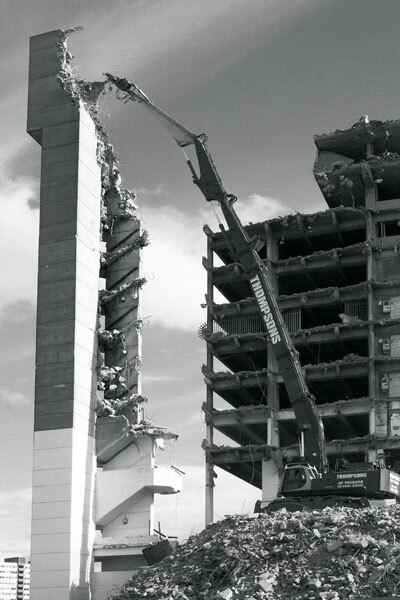 I was impressed by the efficiency, speed and spectacle of demolition on this scale. It seemed such a short time between recording the first cuts at the top to taking Image 18 showing a stair tower fragment lying in rubble. A new and larger collection of Trinity Square buildings is to be completed circa 2012. With shops, blocks of student flats and a large supermarket the concept looks imposing in the developers' generously proportioned and spacious virtual perspectives. It's to be hoped that the actual design, materials and build quality are vastly better than its predecessor and some other more recent developments nearby. Mike Hodges directed the 1971 film, GET CARTER, which starred Michael Caine, Britt Eckland and Alun Armstrong, and was shot almost entirely in North-east England. Some scenes centred on the car park's entrance ramp, decks and the unfinished restaurant, hence this popular name ascribed locally and beyond. In early 2011 Newcastle's Tyneside Cinema screened the film as part of a celebratory fortieth anniversary programme of related films and events. 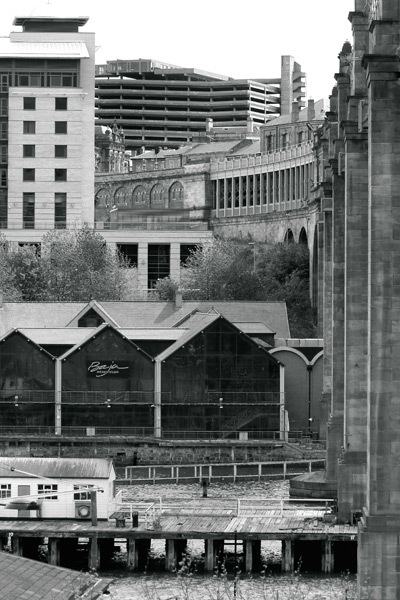 Seeing it again reminded me of just how much has changed in the Tyneside built environment over the past forty years, often for the better but also for the worse. Application then of present day restoration and conversion approaches in redevelopment would have saved some fine buildings from destruction. Some of the film's other locations survive but the depicted grime and dilapidation is now almost entirely in the past. The grim closing sequences were filmed on the Durham coast under a bucket conveyor dumping deep mining spoil into the North Sea. Those collieries, conveyors and waste heaps are long gone and the restored shoreline offers pleasant walks and perhaps the chance find a relic or two exposed by the sea.